For those of you who have been watching my journey from office potato to triathlete, the following picture shouldn’t surprise you. You already know how far I’ve come. In fact, the picture below really, really inspires to make 2010 the best year ever, better than 2009! 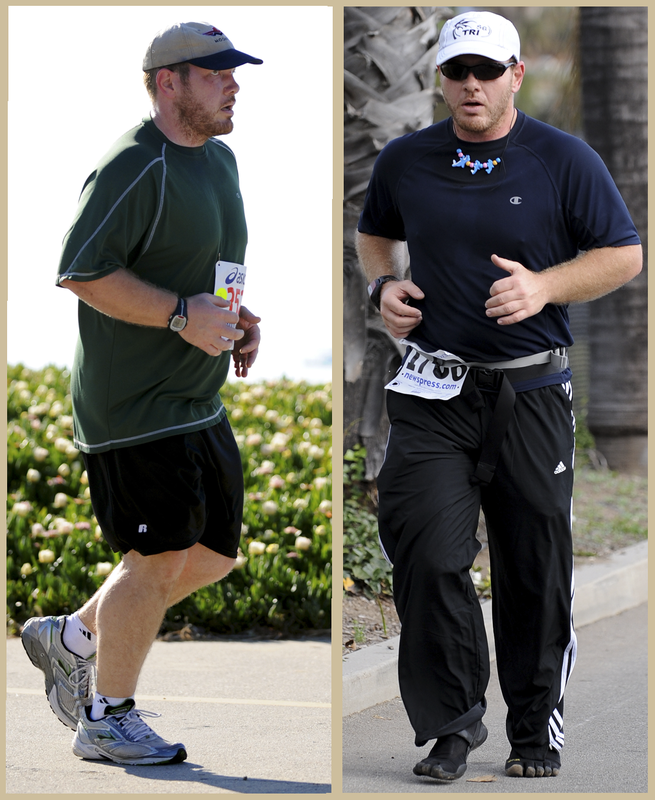 On the left, April 2009 was the Chardonnay 5k. On the right was the NewsPress Half Marathon 5k. For more comparison on the two races, read Tale of Two 5k Competitions. 1) I’ve slimmed down, a lot. Lost about 25 pounds from left to right. 2) My posture is better and my muscles are more built. Thanks to lots of strength workouts, including plyometrics. 3) I’ve embraced technology! Gone is the polar HR on the left, replaced with a Garmin 305 GPS hr monitor on the left. 4) I dress better. Having a decent body makes me want to show it off more. Wearing clothes that fit is awesome! 5) I shunned the shoes! On the left, I am wearing FiveFingers. In fact, I’ve now completed two 5k’s and numerous running workouts wearing FiveFingers. I love ’em! 6) I am far more confident in my abilities. I look so much more relaxed on the right compared to the left. The right was my first competition ever and you can see it on my face. At the end of 2010, I hope to have a similar picture that shows my progress. I definitely have some inspiration to make it happen! This entry was posted in barefoot running, Commentary, Competitions, Fitness, FiveFingers, Goals, Running, Workout Logs and tagged 5K, barefoot running, competition, exercise, Fitness, FiveFingers, Goals, Running, Training, visualization, Workout_Logs. Bookmark the permalink.